...but every once in a while I pull off something that does a pretty darn good Martha impression. So when my sis-in-law told us she was expecting, we were all SUPER stoked. I grew up having two younger brothers. We fought. A lot. Kay...maybe the word 'fought' is a little strong...but..hmmm..nah, it totally isn't. We so did not get along as kids. ;) I pretty much always wanted my mom to take them back and exchange them for a sister. Like a two-for-one trade deal. Thankfully we all grew up, and now all get along. I love them to death....but they still aren't sisters. It's kinda funny how things end up though, because now, 30 years on, I've gone from having zero sisters, to having four sisters (2 step-sisters and 2 sisters-in-law). Hubs' sis was the first of my four sisters to come along and she's always been such an amazing friend and so supportive of hubs and I (I cannot even count how much baby-sitting we owe them!). She's the kind of woman who would do anything for a friend, and so I was just about beside myself with excitement to be able to repay the favour. While we wait for the wee little dude in her belly to make his grand entrance, it was the least I could do (and a whole lot off fun for me, I might add!) to throw a shower for her. 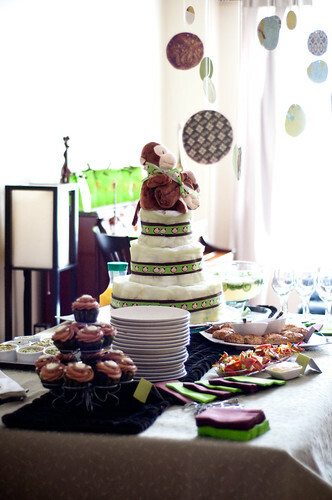 I went with a monkey theme, with green and brown...before you go thinking I'm all creative, I stole this colour scheme and motif from my sis-in-law, who is using it in her nursery. All of these crafts are completely do-able. Trust me - if I can do it, anyone can do it. Also, far smarter people than I have put step-by-step instructions on the internet, so that makes it so much easier. I take no credit for the design. 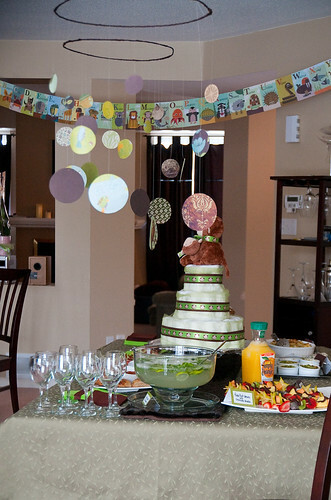 The fabulous monkey ribbon is from Michaels, and the monkeys on the top are from Chapters. 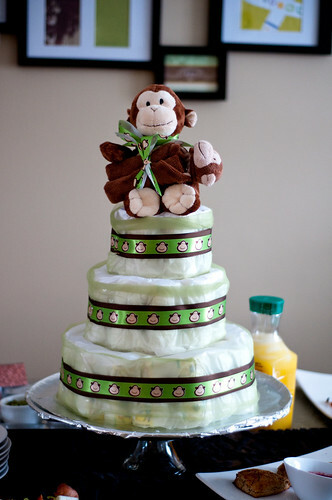 There are detailed, very easy-to-follow instructions to make a three-layered diaper cake on Alphamom. Plus, there is a bottle of bubbly in the middle. Everything is better with bubbly. Can't go wrong here. Stole this idea from Ms. Martha Stewart herself. The hoop is two coat hangers (thank hubs for shaping them) wrapped in ribbon. The circles are made from scrapbook paper. And it's all strung on fishing line. I'd also like to give a shout out to hubs' dad, who had the brilliant idea of stringing more fishing line from my curtain rod to the light fixture plate [I know....been in the house almost three years and still have no chandelier....I'm picky....what can I say]. It worked fabulously, because I got to have my mobiles hanging over the table, and there were no holes put in our stippled ceiling. I bought this frame from Umbra a year ago. And I never put anything in it, so it was just moldering away, up in one of our guest rooms. I had extra scrapbook paper, so I just cut it to size and popped it in. Gotta love it when you put $2 worth of paper in a $100 frame. 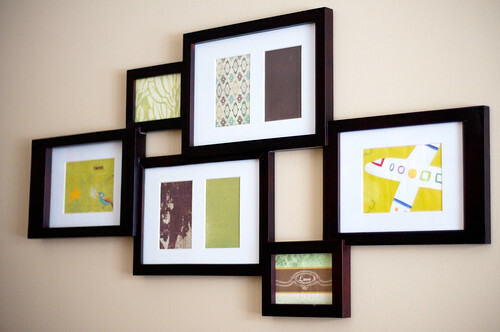 You could emulate this idea with inexpensive ikea frames. These alphabet cards were $5 in the Michaels discount section. I punched holes in them and strung them up with fishing line. Cheap and cheerful. Kickass. Plus, there's a darn cute monkey. I have to say, I totally rocked out this floral arrangement. 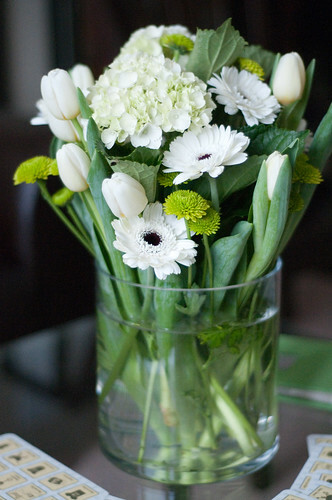 I have a hard time putting even pre-arranged bouquets in vases. I was pleased with this. Because this shower was the day before Valentine's Day, grocery store floral selection was at an all-time high. I just grabbed a few $5 bunches of flower and put them together. The snarky baby shower bingo cards (a little cut off, sorry) were from Knock Knock. I got the idea of them from Morgan's fabulous blog and was fortunate enough to find them at Chapters. They were quite a hoot and exactly the right game for my sis-in-law....who is not the type to embrace having her belly size guessed, or eating mysterious smears of baby food out of diapers. This was much more her (and my!) speed. These didn't turn out *quite* as cute as I would have liked. I totally fell for these adorable little green takeout boxes, but at $2/each, it was a little too hard to justify. 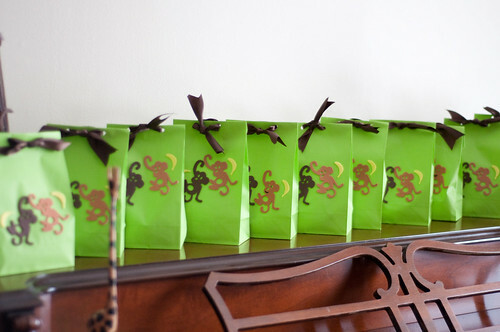 The green bags were $4 for 12 at Michael's, and I filled them with green and brown candies from Bulk Barn. The monkeys on the front are from a foam sticker set. I got these guys (pic from zazzle.ca) from Zazzle.ca, in a super fabulous and sparkly ice metallic paper. I thought they were awesome. A little overpriced, but whatever. Super cute. Service was pretty quick and quality good. The only complaint I have is that they have the designers name and zazzle.ca printed on the back...considering the invitations are not exactly cheap, I don't think I should have to cheapen my invites by advertising for their company! I would use them again for casual invites, but the ad on the back would make me hesitate for wedding invites. Anyway, you don't come here for martha-esque triumphs....you come for the food. And you know what....I'm often really hard on myself when it comes to food (things are always 'too....something' [you name the adjective]. Too salty, too bland, too hard, too soft, too...whatever. Everything I made turned out pretty great! This is a shocker. everything looks awesome! What a great SIL you are! Just the right mix of cute and elegant. I think you are TOTALLY a Martha! What a lucky SIL you have, not mention a very fortunate little future nephew.